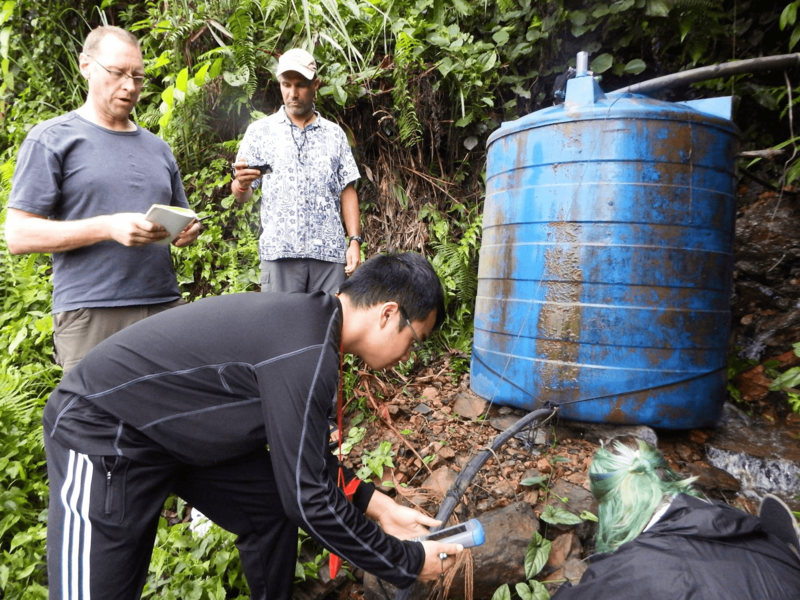 In photo above, Johann Lim (CMC ’18) conducts water tests during Clinic Trip to Malaysian Borneo with guidance from Associate Professor of Environmental Analysis Marc Los Huertos and Yale-NUS Professor Brian McAdoo. Deadline has been extended to Thursday, Oct. 12, 2017. EnviroLab Asia is a dynamic 5C program that focuses on understanding environmental issues in East and Southeast Asia. We aim to engage communities and explore what comes out of the intellectual exchange between the humanities and social sciences, environmental analysis, and various other fields to generate new scholarship about environmental issues in Asia. This is an initiative at the Claremont Colleges funded by the Henry Luce Foundation. The EnviroLab Asia Class is a unique course that embodies a liberal arts approach to understanding environmental issues in Asia. The Class will prepare students to conduct research on the Clinic Trip, which will take place at the end of the Spring semester. Student Fellows do not have to pay any travel costs; travel costs will be covered by EnviroLab Asia. Due to the demands of preparing for the Clinic Trip, the class is a required 2-class load (EA21 and EA31). This requirement provides adequate time for students to learn cross-disciplinary concepts and techniques for field research. Co-taught by two professors from different disciplines, students will be exposed to methodologies from the sciences, humanities and social sciences. Guest lecturers from different disciplines will also visit the class. Students will also be divided into Class Clinic Labs that will work on some type of research, communications or policy product advised by a faculty member. The Class will also work with students and faculty at our partner institution Yale-NUS College, a liberal arts college in Singapore. For Spring 2018, the Class will examine environmental issues in Southeast Asia. Specifically, the Clinic Trip will take place in Thailand and students will work with our local partner Burapha University in Chonburi, Thailand. The class will explore the following themes: infrastructure & power, water quality, biodiversity, hydro-modification, aquaculture, agriculture, trans-boundaries & governance, agency & built environment, performance art & resilience. EnviroLab Asia will cover the travel costs of the Trip (airfare, lodging, and food). Professor Albert Park (History, CMC) will teach EA21, offered on Tuesdays at 1:15-4pm and Professor Marc Los Huertos (Environmental Analysis, Pomona), who will teach EA31, offered on Thursdays 1:15-4pm. Class sessions will take place at the Hive. Food and Rural issues: Led by Albert Park (History, CMC), this Clinic Lab will utilize a humanities and social sciences approach to understanding the intersection between agriculture, food issues and rural development in Thailand and the region. This lab will evaluate the pressures on the environment due to increasing demands of foodstuff from the agricultural, livestock and aquatic industries, especially from Thailand’s massive shrimp farming industry. We will look at the rise of alternative systems of food production in Thailand and other parts of Southeast and East Asia that are ecologically sensitive and community oriented for social renewal in the rural. In so doing, this lab will come up with policies related to food security/sovereignty, sustainable food production and climate change and protecting and enhancing rural life and culture. Mangroves and Shrimp Farms: Led by Marc Los Huertos (Environmental Analysis, Pomona) and Branwen Williams (Environmental Science, Keck Sciences), this Science Clinic Lab will focus on mangroves and shrimp farms. The relationship between these two systems are both social, economic, and physical. We will evaluate these relationships using a range of social and scientific approaches. In particular, we will evaluate the role of nitrogen (and phosphorous?) as a fertilizer and pollutant. Fertilizers are used to increase farm productivity but it can also cause eutrophication when nutrients leave the farms. Mangrove forests are valuable habitats in the coasts and protects the shoreline from erosion. We will be using various scientific methods to evaluate ecosystems processes, such as nitrogen dynamics, shimp productivity, and mangrove growth. Performing & Visual Arts: Led by Anne Harley (Music, Scripps), this Clinic Lab will utilize oral history, community-based theater techniques, and visual arts to create a performance piece about how local communities see environmental issues. Students selected in this Lab are required to travel to Southeast Asia in January and in May 2018 to begin their research. See below for travel information. Candidates for this Lab must be able to think in intensively interdisciplinary ways, welcoming arts, science, and humanities to the project and also ideally have a track record building social capital, through the arts or otherwise. Unique to this year’s program is a special research-based trip to Vietnam funded by The Cion Trust that will take place in January before the spring semester begins. The purpose of the trip is to introduce students to issues the Class will study, develop relationships with each other and with our research partner Yale-NUS, and provide students an opportunity to have a comparative analysis of environmental issues in Southeast Asia. The Vietnam Trip will explore similar themes of infrastructure & power, water quality, biodiversity, hydro-modification, agency & built environment, culture, arts & resilience. The Cion Trust will cover costs of travel. The Vietnam Trip will take place January 2-15, 2018. Students selected to be in the Performing & Visual Arts Clinic Lab will travel to Thailand in January to start research in preparation for their final projects and then join their collaborating EnviroLab colleagues in Vietnam on Jan 8/9. These students will be the first to meet key Burapha University and community partners, and work in preparing sites for performance, arts materials, and building relationships, laying the groundwork for the culminating performance projects in which all EnviroLab students will participate in May 2018. EnviroLab Asia will cover the cost of travel. Application to be an EnviroLab Asia Student Fellow is due Oct. 9, 5pm. Deadline has been extended until Oct. 12, 2017. If you have any questions, please email Karin Mak, Project Administrator of EnviroLab Asia, at kmak@cmc.edu. If you would like to go to Vietnam in January 2018, please share what makes you a good fit for this specific trip. What questions would you like to explore? In what ways do your past experiences make you a strong candidate to participate? (Please answer in 200 words or less.) Again, EnviroLab Asia Student Fellows are not required to go to Vietnam, but are given the option of going. While this is an interdisciplinary initiative, each student will be assigned to a Class Clinic Lab. See above for descriptions of each Lab. Please describe how you are a good candidate for each Lab. What do you hope to learn? What questions would you like to explore? What past experiences make you a good fit? How would you contribute? Please write a separate answer for all Labs. Indicate the Trips you are able to participate in.